You know what turns an ordinary Thursday into a day you’ll never forget? A grappling hook, that’s what! Think about the last time you saw a grappling hook...it’s been awhile, huh? We guess it may have even been the last time you watched Batman do his thing on the big screen. That makes this accessory rare and remarkable and totally unique! Not to mention that carrying this Batman Grappling Hook means that instead of just driving home to your cat after work next Thursday, you can go out into Gotham on an adventure, scaling tall buildings and catching criminals! Of course, you could also just use it to spruce up your Batman costume this Halloween. No matter to us! The licensed Dark Knight accessory measures 8" long and features a black, molded handle. 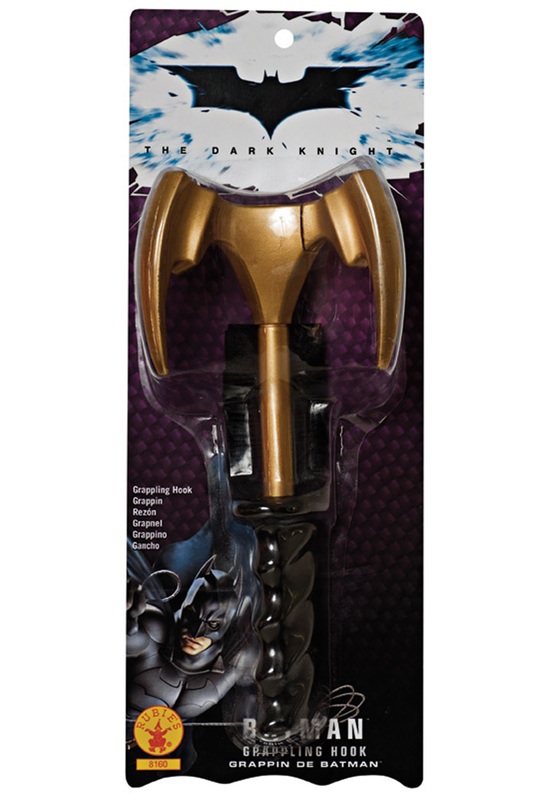 The gold hook has three prongs and a black Batman logo on each one, so you can swing into action and strike out on adventure in superstyle with this terrifically authentic toy!